Gerry Anderson, the hugely influential creator of Thunderbirds and Captain Scarlet, made a spectacular return to puppet animation in the early 1980s with an exciting new series produced with Christopher Burr. Thrilling yet another generation of children (and adults! ), Terrahawks introduced a new elite force to defend 21st-century Earth against a host of alien invaders. Led by the heroic Tiger Ninestein, the Terrahawks crew consists of C..
Gerry Anderson, the hugely influential creator of Thunderbirds and Captain Scarlet, made a spectacular return to puppet animation in the early 1980s with an exciting new series produced with Christopher Burr. Thrilling yet another generation of children (and adults! ), Terrahawks introduced a new elite force to defend 21st century Earth against a host of alien invaders. 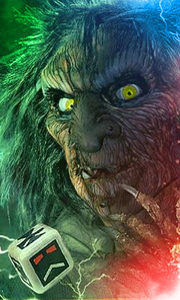 Led by the heroic Tiger Ninestein, the Terrahawks crew consists of C..
Own Terrahawks - The Complete Series DVD from Deff, DVD, Blu-Ray & 4K Video Specialists - Free UK Delivery..
Own Terrahawks - The Making Of DVD from Deff, DVD, Blu-Ray & 4K Video Specialists - Free UK Delivery..
Own Terrahawks - Volume 2 DVD from Deff, DVD, Blu-Ray & 4K Video Specialists - Free UK Delivery..
Own Terrahawks - Volume 3 DVD from Deff, DVD, Blu-Ray & 4K Video Specialists - Free UK Delivery..
Own Terrahawks Series 1 DVD from Deff, DVD, Blu-Ray & 4K Video Specialists - Free UK Delivery..